From the Hana Maui Botanical Gardens all the way to the Seven Sacred Pools, there is a lot of beauty to be discovered. While you are here, you need to stop in at the Hasagawa General Store and take a minute to enjoy the black sand beach at Hana Bay. The beautiful lush town of Hana is located on the eastern side of the island. It is known as one of the most isolated areas in the state of Hawaii. The drive to Hana is very well known as it's about 52 miles long and it is pretty much hair pin turns all the way there so it takes longer than you would think. Plus, all of the stops along the way you don't want to miss out on... waterfalls, trails that take you up into a forest of bamboo and magical scenic stops that make for great panoramic pictures. This drive will take you along the Northern shore of Maui and it is an unforgettable experience. There are many swimming holes near Hana that are located in the Haleakala National Park. The climate is very wet and hot all year. The surfing culture in Hana is pretty prominent and amazing to watch. If you are a nature lover Hana is the place for you. It's a tropical rainforest that is very peaceful and relaxing. Bird watchers love it here as the Japanese White Eye and House Finches fly about. Hana is one of the best places to go for a snorkel on Maui. You can go to Hamoa Beach, Red Sand Beach or Hana Bay and swim with the Yellow-tail Wrasse. 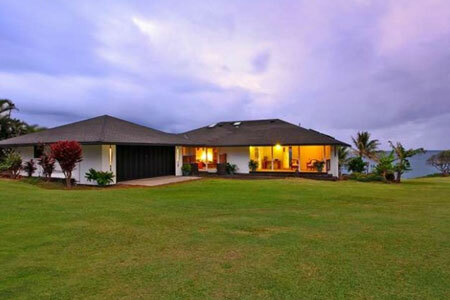 Shop the Maui MLS here for homes for sale in Hana Maui, Hawaii. If you would like to see one or several of these Hana luxurious homes for sale let me know. Roger Pleski - 808-344-0180 or email me at roger@hawaiilife.com.